In a true sense of collaboration, Alexandra and I will both be writing three linked posts on the different aspects of this collaboration: foundational, collaborative, and results. Aside from having worked together over the last seven years, this series derives from a talk we gave at BALEAP last April entitled “Interactivity between a first-year content course and EAP course assignment for skill transferability“. In today’s post, we situate the collaboration in terms of the foundational aspects of our program and how our two courses align with each other, with an example assignment in my course that scaffolds skills in hers. You can skip over to her post here if you like. Admission: In the International Foundation Program (IFP), all students have academically qualified for undergraduate study in the faculties of Arts & Science, Architecture, and Music, but have not met the minimum language proficiency required for direct entry by these faculties. Demographic: The majority of students are from mainland China. A minority of other students come from other countries. Numbers: Increasing every year, for 2017/18 there are 301 students, generally split between 20 sections, which equals between 14-16 per class. Structure: Every student attends four year-long sheltered university courses, including the two featured in this series, plus Academic Listening & Speaking and University Skills & Strategies. Thee three language/academic support courses scaffold skills needed to succeed in the History course, as well as undergraduate work more broadly. Conditions: All students are accepted into their undergraduate programs on the condition that they pass each of the IFP courses with a minimum of 60% (“Adequate”) grade, according to the faculties’ grading scheme. All courses are run with tests, assignments, and final exams, as any other undergraduate course does. Critical Reading & Writing focuses on exposing students to different genres, reading texts intensively for use in assignments, and communicating effectively in writing. One major challenge that is the focus for this series, however, is enabling students to get the most (and correct) meaning from the texts so they can use the ideas from them in their own writing. In comes Academic Reading Circles (ARC) – an active approach to reading intensively, whereby students individually examine a text from one particular aspect (e.g. main ideas; contextual references; connections building, linguistic features, etc.). 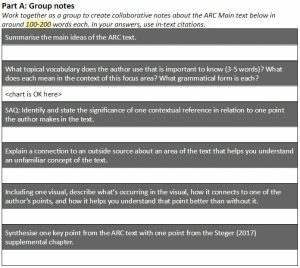 Students then negotiate meaning in small groups to form a co-constructed understanding of the text together (see here if you’d like to know more about how ARC works). However, I wanted to the individuals and groups to be more accountable for the learning from their discussions. How could I build an extension to ARC that utilises this group understanding in written format? Collaboratively, groups determine the broad topic and focus area of the text, write out the APA reference for it, and consider its genre, audience, and purpose–all skills we learn about throughout the term. Individually, each student translates their ideas about the text, upgraded from their group discussion about the text, onto the spaces provided in 100-200 words, using in-text citations. 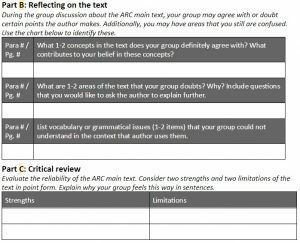 Then as a group, they peer edit each other’s writing as everyone gets a group mark for these two parts of the document to stress the importance of co-constructing comprehension. In the final two parts of this assignment, groups work together to identify concepts in the text they agree with, those they doubt, other unresolved linguistic issues that came up during the discussion, and finally attempt to critically examine the text in terms of its strengths and limitations. These are not specifically graded at the end, but are areas more for feedback. 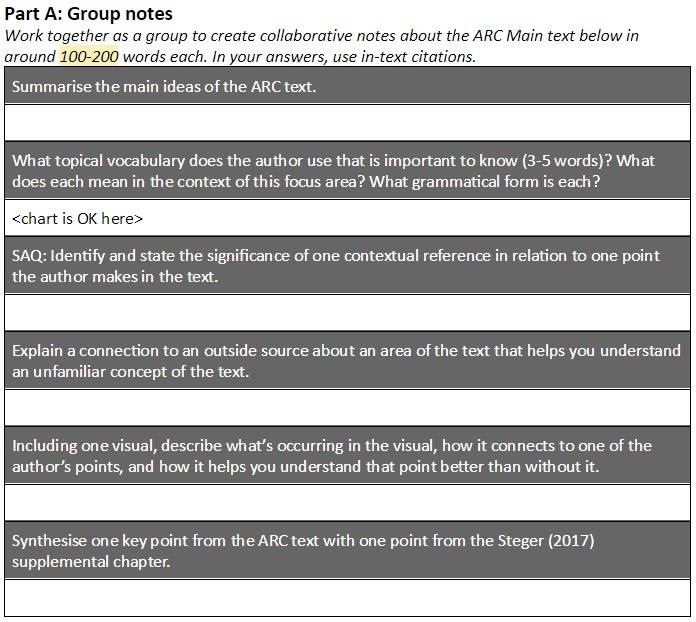 This assignment pushes students beyond reading a text and then forgetting about it once a quiz on the text is done. Instead, it gives more weight to the group negotiation aspect of Academic Reading Circles insofar as in order to do well on the graded ARC Notes, the entire group must work together and check each other’s understanding, ergo helping everyone improve. Individuals become more accountable for the group understanding and learn to work more collaboratively with each other. In the next post, I’ll talk about the next challenge: connecting this assignment to the History course so that students use it to scaffold skills needed to succeed there. 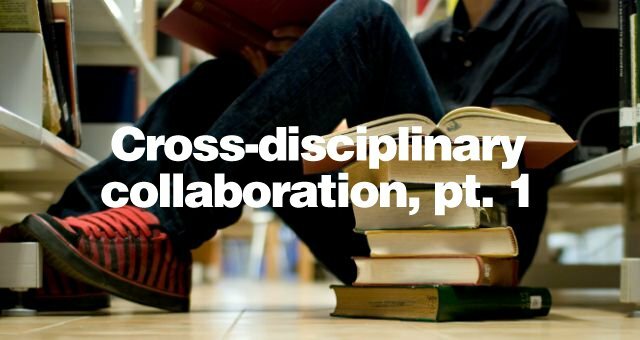 In the meantime, in her own post my colleague, Dr. Guerson, talks about her role in this collaboration, the problems she’s faced with the same students regarding lecture content, and an assignment she began doing in her course. I encourage you to read it before next week. Excellent! Thanks for sharing this and I look forward to reading part 2 now.